Welcome to the website that accompanies the Growing with Science blog. 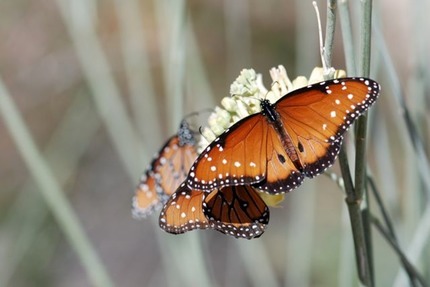 Butterflies and moths go through a complex series of changes during the life cycle, a process called complete metamorphosis. Let’s explore the life cycle of the queen butterfly first, moth second, and then suggestions for activities at the bottom. 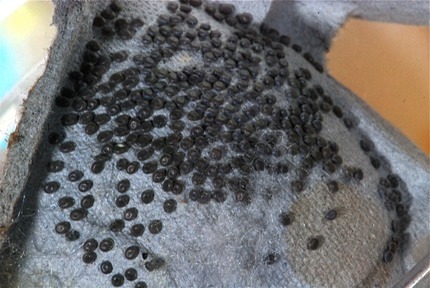 The eggs usually start out white, but darken as they get close to hatching. A larva, or caterpillar when we're studying butterflies and moths, emerges from the egg, and begins to feed on the plant. 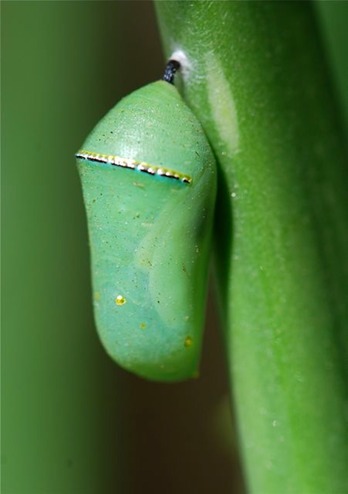 When it has reached its full size, the caterpillar transforms into a pupa, called a chrysalis or chrysalid for butterflies. After a week or so, the chrysalid begins to turn black and you can see parts of the developing butterfly inside. A few more day, and out comes the adult butterfly! The adult females mate with males like this one. 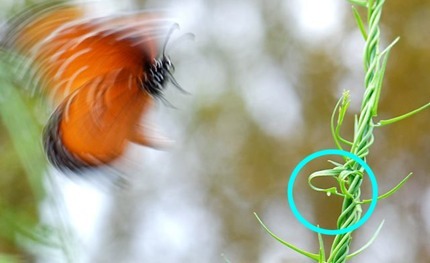 The female butterflies then lay eggs on host plants, like this vining milkweed. Can you see the white egg she just laid? 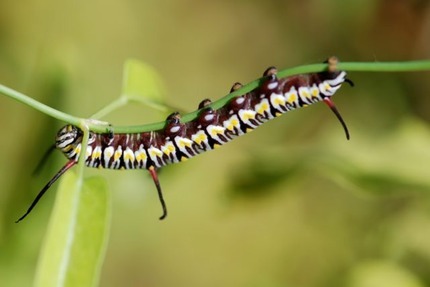 As we talked about on the butterfly and moth identification page, the main difference between moths and butterflies is that moth caterpillars often make a silk bag around themselves, called a cocoon, before pupating. 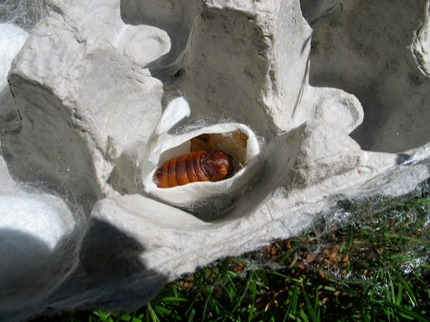 Silkworms lay their eggs on egg cartons or paper towels. 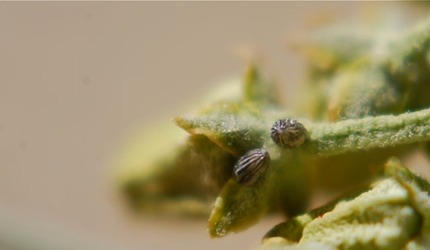 The eggs hatch into tiny caterpillars. 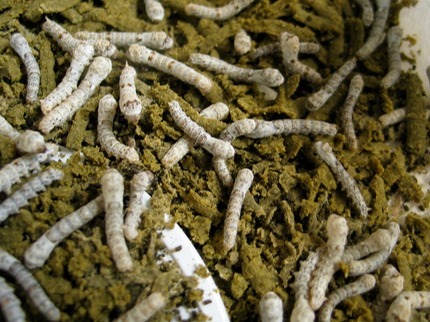 These silkworm caterpillars are eating an artificial diet that is kind of like a stiff pudding. 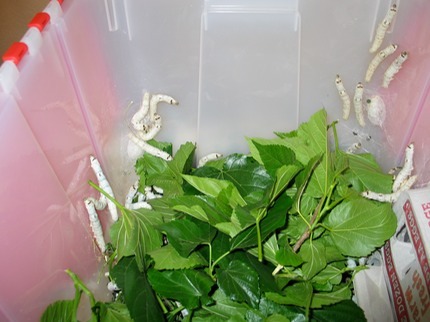 Silkworm caterpillars may also eat the leaves from mulberry trees. Either way, they grow and grow, shedding their skin or molting several times. When the caterpillar is ready to pupate, it spins a cocoon. This one chose to spin in an egg carton. Inside the cocoon, the pupa forms (it didn't hurt the pupa for us to cut open a flap of its cocoon). 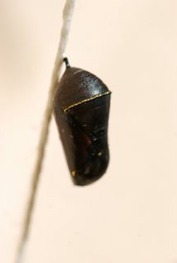 The moth emerges from the pupa within the cocoon first. 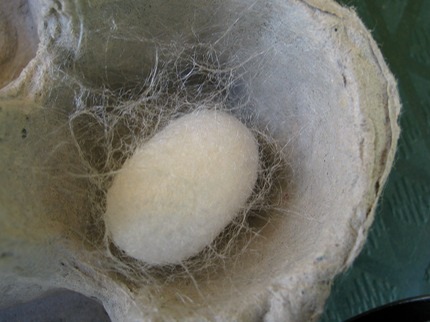 Then it spits an special chemical on the cocoon and a hole dissolves in one end. 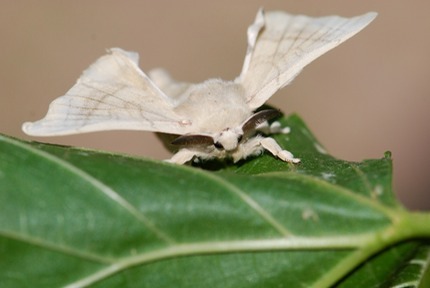 The silkworm moth can then wiggle its way through the hole and escape. 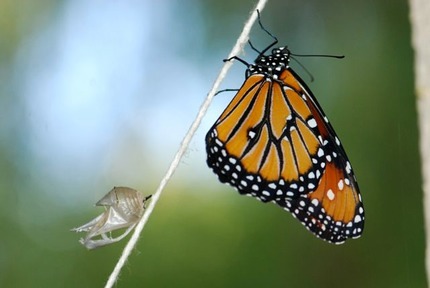 Plan where each stage should go in the cycle: egg, caterpillar (larva), chrysalis or cocoon, and adult butterfly or moth. Leave room for a title at the top. Draw arrows between the stages or connect them with yarn. Be nice to the environment and never release captive or farm bred insects to the wild.